Cedefop, together with the Bulgarian Presidency of the Council of the EU organises the 5th Cedefop Brussels-based seminar. 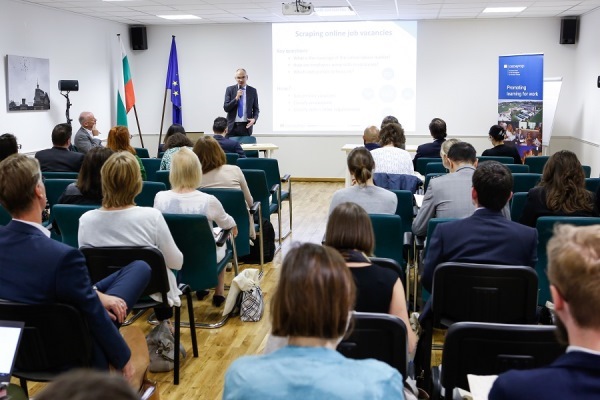 These seminars, organised in cooperation with the rotating EU-Presidencies, build on Cedefop research and analyses and address issues relevant to European debates on vocational education and training (VET) and employment. To which extent can integrated labour market and skills information systems, namely systems and processes collecting, analysing and disseminating a wide range of data on skill mismatches to multiple actors (e.g. policymakers, social partners, VET providers, guidance counsellors, citizens), inform VET and employment policies in EU Member States? What are the opportunities and challenges or new data analytical instruments, reliant on big data and/or artificial intelligence (AI) methods, for building better information systems to influence policy? The objective of the 5th Brussels-based seminar will be to highlight the importance of a ‘blended’ approach, taking into consideration the latest developments in big data and AI-based tools for developing labour market and skills intelligence. Cedefop and external experts from pioneering public and public organisations (e.g. OECD, IBM, VDAB) will seek to debate promising approaches in effectively integrating new big data or AI-based data analytics within existing skills anticipation/matching processes of EU countries. Cedefop experts and the invited speakers will present their current research and policy instruments used for improving skills matching capabilities and diagnostics.